Are you looking for a simple way to add a little bit of personality to your home? Add this sweet Louise 1 inch x 6 inch to your next project. 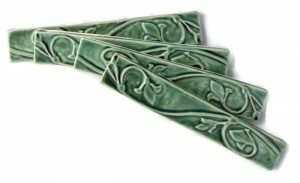 Choose the hand painted finish for this Vine Liner tile to add an element of vintage or choose one of our many color glazes to add a pop of color! Each tile starts as a slab of clay, hand carved and cast in plaster. Take a moment to read about our tile process. We craft every tile just for you, so please allow 4-6 weeks for delivery. We have several glazes in our shop for you to choose from. A variety of colors to match any tile installation and décor. We can help you achieve the look of your dreams. Do you still have questions? You can find answers to our most frequently asked questions here. You can live in a home that directly reflects what is important to you and your family. Choose unique tile that reflects your personality; choose Fire Creek tiles today! Sweet Goat Tile~A friend from the farm.